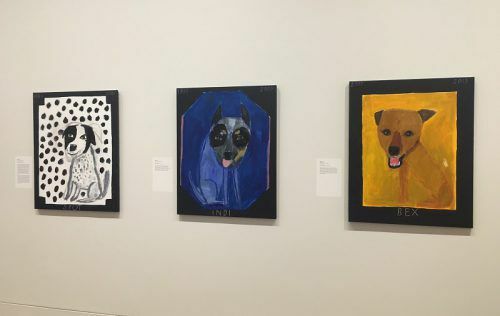 DOGS rule in the National Portrait Gallery’s massive new summer exhibition, “The Popular Pet Show,” likely to have canine lovers jumping for joy all over Canberra. The normally serious curator, Dr Sarah Engeldow, has taken a light-hearted approach to the fact that animals in art are a distraction from their human counterparts, with canine subjects often proving to be more personable. A press call proved that most artists, from Ken Done to Shen Jiawei, are keen animal lovers in real life. As Melbourne painter Kristin Headlam explained to “Citynews,” there are few pleasures to equal “the joys of being in bed with the animals,” an experience reflected in her 2000 Doug Moran prizewinning portrait, which shows herself in bed with two elegant Burmese cats and the scene-stealer, her faithful dog Pamphlet, in the foreground. Not only had the artist enjoyed the pleasure of winning the richest portrait prize in Australia but she had also received dozens of letters from total strangers, including one from a member of Parliament in Queensland telling her that his dog had died. Headlam agreed that humans express their emotions most readily through animals. These days alas, Pamphlet has gone to the happy hunting ground, but his replacement, Basil, is portrayed in his own painting as a hound with the penchant for ‘stepping out’. In one of the many extended captions in this show, useful for newcomers to the gallery, Bail is described as “a speckled beauty – a long-legged leaper and an exceptionally vocal dog, with a great register of sounds”. Visitors will know what she means. 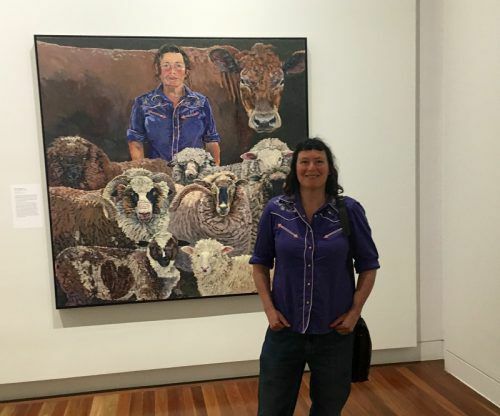 Lucy Culliton with sheep in foreground and ‘Bison’ at back. Artist Lucy Culliton has broadened the scope of the exhibition with chooks, a few dogs, magnificent sheep and most of all her favourite cow Bison, fond of a good cuddle she said. As an adjunct to her work were ceramic sculptures involving animals by her sister Anna. The show put together by Engeldow features pets of all shapes and sizes – drawn, painted, and sculpted by 15 contemporary Australian artists. 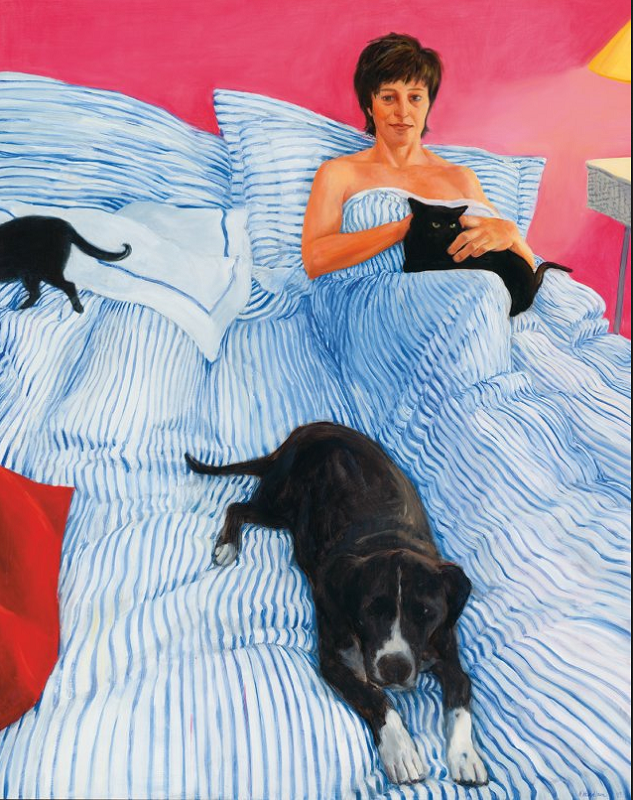 Featuring more than 160 portraits, including many large scale paintings, of famous (lots of recognisable showbiz people with their pets) and obscure Australians and their pets by artists Nicholas Harding, Lucy Culliton, Darren McDonald, Anna Culliton, Fiona McMonagle, Ken Done, Noel McKenna, Graeme Drendel, Robyn Sweaney, Kristin Headlam, Shen Jiawei, Jude Rae, William Robinson, Janet Dawson and Davida Allen. A wall of Ken Done’s dogs. From a purely artistic point of view the exhibition bears a closer look. “Some artists go at their subjects in fervour and some labour over individual hairs. For me, even comparing how much blank space different artists leave around a dog or a bird is interesting,” she says. A number of ‘pet-tastic’ (punning is rife at the NPG) activities and events will be held in conjunction with “The Popular Pet Show”. The first celebrates farm-yard pets with a country fair from 10am to 2pm on Sunday, November 13. In the New Year, dog lovers will be able to bring their furry companions to a ‘Paws for Art’ day with a variety of dog-themed activities, demonstrations and goodies. “The Popular Pet Show” opens to the public today, Friday, November 4 and is on display until March 13. Bookings to portrait.gov.au or at the information desk at the Gallery and young people under 18 are free.